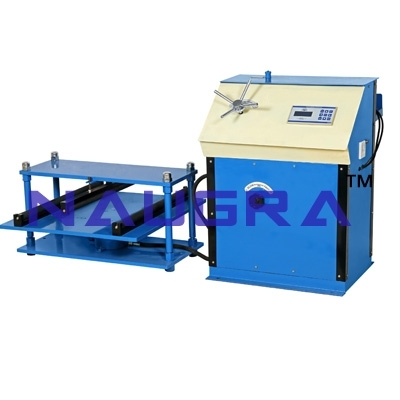 MOR Testing Machine - The machine consists of a load frame and motorized pumping unit. The lower platen has two rollers, the distance between which is adjustable. The upper platen has also roller. Micro-processor based Digital Load Indicator to indicate applied load is fitted in the Pumping unit. The Pumping unit is separate electrically operated, housed in a cabinet. On/Off switch and a slow/fast lever to control rate of loading are fitted on the front panel of the pumping unit. A micro switch and relay fitted inside the Digital Load indicator to protect the unit from over loading. Max. Tile size 660 X 660mm Direct reading of total applied load in KN Direct reading of Flexural strength in N/mm2 - No calculation required Peak hold facility RS 232 interface (Optional - at extra cost) Direct analytical reports on computer (Optional Auto generation of load/time graph. (Optional) Overload safety cut out Password protected Calibration to prevent Un authorized manipulation Tyupe of Pumping: Electrical Locading Range: 100 KN Least Count: 0.1 KN Optional Accessories at extra cost: PC link software Wireless PC link software. We are leading manufacturers, suppliers & exporters of MOR Testing Machine. Contact us to get high quality designed MOR Testing Machine for schools, colleges, universities, research labs, laboratories and various industries. We accept bulk orders for government tenders in all countries around the globe. For similar products visit at main page of Analytical Lab Instruments.